The following is a guest post. If interested in submitting a post, please contact me. Buying a home can be one of the most exciting times in a person’s or family’s life. It’s a very big investment to make for you and your family’s future. However, in many cases the initial rush of emotions and thoughts of being a homeowner cloud our minds from making an intelligent decision – one that will be best for your financial future. There are many tools and guides available to help take you through the process, so take the time to do your due diligence. Ask for advice and read books about buying houses. Trust me, you do not want to mess this up. When my wife and I first thought about buying a good home over 3.5 years ago, we really had no idea what we were doing. Back in early 2009 the government had just come out with a stimulus plan and was offering $8,000 to first-time home buyers. This MAJOR carrot along with the fact that interest rates were at recent lows and housing prices had just taken a beating from the 2008 debacle led us to believe that buying a home was a no-brainer. Amidst all of the emotion and enthusiasm that came with buying our first place, we didn’t really stop to think about what we were getting ourselves into. 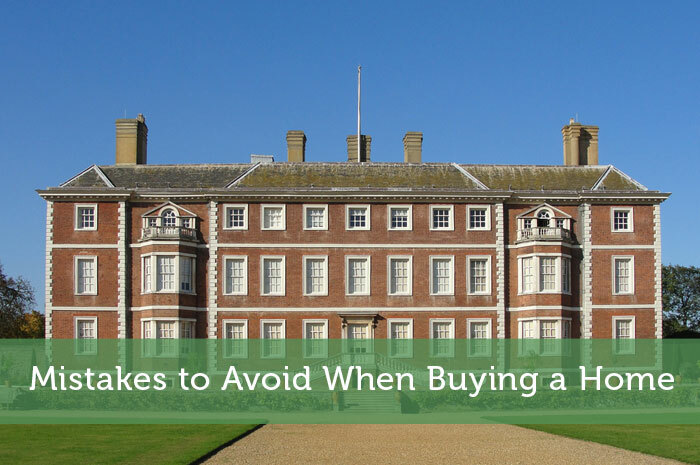 Before you buy a home, take some time to avoid these common mistakes that will cost you dearly when you look to sell it. As with all things in real estate, one of the most important factors is the location of your home. The location includes things such as the school district the house falls in, how quickly it takes to get to the nearest highway, and the overall shape of your neighborhood. When my wife and I bought our first home, I’ll just say that location was the last thing on my mind. We wanted a place on the outskirts of Kansas City, in a smaller town, and with few neighbors. We also didn’t care much about the school district considering that we didn’t have any kids. What once fit us quite well on the location front no longer works for us as our lives have evolved over the years. The once-attractive location has become a burden when it comes to traveling to work and visiting friends and family. It may be tough to project what the future holds for you and your family, but thinking about where you’re going to be 3-5 years from now plays an important role in choosing a location for your next home purchase. While the older generations were accustomed to buying a home and living there for 20+ years, younger adults have proven to be much more apt to move on a whim. It might be a simple move across town, a move up in home, and in some scenarios it involves a move halfway across the country. When you first consider buying a home, it’s extremely important to have a realistic mindset on how long you’re going to stay there. While predicting your future may again be challenging, it’s absolutely necessary. The shorter amount of time you stay in your home, the harder it will be to sell – especially if you didn’t have a large down payment. In our scenario we only put 3% down on our home; yes, a no-no in the PF community. Due to this and the fact that we got a 30-year mortgage, we have very little equity built up in our home. The less equity you have, the less wiggle room you have when fielding offers on your home when you go to sell it. While living in your home longer allows you to build more equity, it also allows time for the house to increase in value. Although some cities sport booming real estate markets, most places throughout the U.S. are stagnant. Even though we bought our house in down market, the increase over the past 3.5 years has been minimal. In regards to resale value it’s also important to keep in mind the condition of the home you’re looking to buy. If you’re buying an older home, then it’s likely you’re going to need to invest in significant upgrades when you look to sell it. While it’s important to buy a home that can fit in your budget, it’s best to find one that is newer or has been upgraded to match the times. Newer kitchens, nice master bedrooms, beautiful bathrooms, new roofs, A/C and heating units, and 3-car garages are becoming the standard and these will be things you’re competing against when you look to sell your home. Failing to upgrade your house and keeping the resale value in mind when buying it may prove to be the difference between selling your house quickly and sitting on it for 90+ days. Of course it’s nice to look at houses that are out of your budget. Who doesn’t want to look at a 3,000 square foot house with 4 bedrooms, 3.5 baths, and all the new amenities that come with the higher-end homes? While we live in a culture that preaches frugality and pinching pennies, I’m often shocked at how often people make MAJOR financial mistakes when it comes to the big-ticket purchases. I’ve coached people for a long time and winning with money isn’t about how many dimes you can save by clipping coupons. Ultimately, winning with money comes down to the decisions you make on the biggest purchases of your lives: vehicles and houses. Although the standard when buying a home is to strap yourself to a 30-year mortgage, it’s best to find a house where you can afford a payment on a 15 or 20-year mortgage. The reason the 30-year mortgage became standard in our world is simply for the mere fact that people wanted nicer, bigger, more beautiful houses than they could really afford. While you may be looking at the 30-year mortgage payment on a $200,000 home and getting excited at the belief that you can afford it, adding the expenses above could likely put that home out of your price range. Especially if you consider taking the mortgage down to a 15-year fixed note where it adds $480 to the monthly payment. When purchasing a home, you have to be sure that you will still be able to finance your mortgage and other expenses for the years to come. Buying a home is one of the biggest decisions a family will make, both for their financial futures and their lives in the short-term. The people that get too excited and overlook some of these large traps will be in a vastly different situation than the family’s that carefully consider what purchasing a home means to the immediate situation, while also keeping in mind what it means 4+ years from today. How much thought did you really put into buying your first house? Were there mistakes you make because you were too excited? What were the costs of your mistake? What things would you have done differently? Feel free to share your answers below. Great tips! I agree with all of them…especially about not becoming house poor. I have never been in that position but I know people who are. It doesn’t look fun. Thanks for allowing me to guest post with all of your readers, Jeremy! Don’t forget about Home Owners Association (HOA) dues. Especially in gated communities and condos there are almost always a given. Even in some areas that aren’t sectioned off from the rest of the surrounding area, there is a change that one may run the community. And, unfortunately, it’s something that so many people don’t mention about much when they talk about home-buying tips or things to consider when planning to buy a home. This isn’t important solely for the added cost to the monthly budget. No, it’s important because of the things that need to be done to adhere to community standards. Not only are there HOA fees, but they require certain maintenance to be performed regularly which may not be thought of when considering routine maintenance–pressure washing roofs being the most common. The associations also control who you can sell (or rent to) and need to approve the transaction before you can move forward if that time ever comes. You have to think long term in addition to how much a purchase like this will affect you in the near-term. Great point, Eric! I didn’t think about that when writing it up but it’s absolutely another “hidden” cost that most people don’t consider. Our HOA fees are very reasonable but they’re especially high when buying condos! We bought our first condominium two and a half years ago, fully intending to use it as a rental and an investment property in the long run. I think having this mindset is important even if you intend on living in your home forever. Your house is usually the biggest asset in an individual’s portfolio and you can’t afford to make emotional decisions when so much of your financial success hangs in the balance. For a first-time home buyer I think it’s pretty tough to think rationally. Especially if you’re not already savvy with money. The people that are smart with the finances will certainly have a leg up in this situation though. We probably didn’t put enough thought into our first home purchase. We were too excited with having new jobs and the opportunity to stop renting after all those years in college. While we stayed in a price range that we could comfortably afford, it was way more house than we actually needed. Location was also less than desirable with a 20 minute drive to work, school, civilization. We learned our lessons and now have a smaller home, closer to town. K, these were much of the same problems we ran into. It’s quite surprising how many little mistakes add up to be a big deal at the end of the day. We’re hoping to sell our home soon and move much closer to home. I hope it works out, but not thinking about our resale market has hurt us the most when looking to unload our house. Great Tips Jason! It’s so important not to overstretch your finances. Having the house of your dreams is obviously ideal but if you have to put the rest of your life on hold to get it then it’s not worth it. Don’t forget to factor in meals out, holidays and possible new additions to the family when deciding a maximum budget for your mortgage payment! Yes there are definitely all kinds of things you have to factor in when deciding how much house you can afford. Sure living in a nice house would be preferable, but you have to consider whether that will force you to make other sacrifices in your lifestyle. Making such sacrifices for 25 years can really affect your overall happiness. Good tips Jason and nice to see you on another site! I’ve got to agree with all, but location is the biggest. And not even in terms of today, but in terms of where you see things heading in 10, 20 years. We’ve lived at our first house for almost 9 years now. It seemed like a great area at the time, but now we realize that we’d like to do better. Even though at the time we thought we had thought of everything, its amazing how much you learn about a house and would do over again. It’s so hard to project the future a buy a home that will fit your family now while taking into account how the town will develop. There are a few pockets in some suburbs of KC that are good now, but overall those cities are TERRIBLE. There is no chance I’d consider moving to them. The city we’re looking is one of the few in the area that still has some class…although it’s just a matter of time before it goes downhill. Long-term I imagine we’re going to have to move to the KS side. lol. I know exactly how you feel. I wrote a post a couple weeks ago about how buying our current house in 2008 has been our worst financial decision. We did pick a house well within our budget, but in what turned out to be a terrible location. In fact, it wasn’t even six months after buying it that my wife was talking about moving again! We put hardly any money down, and our house is worth almost exactly what we owe on it, not including realtor fees. If there was ever an “undo” button in life, I’d use it on our house puchase. Justin, hindsight is always a nice thing to have. The great thing is that you’ve learned some valuable lessons and will hopefully avoid making the same mistakes when you’re able to sell your home and look for a new one. My hope for the post was definitely to help some first-time home buyers. The initial emotions of buying a home are so strong and it’s really hard to think clearly and make a logical decision (for the short-term and for the long-term). All very important tips! When I purchased my home I filtered by location, location, location and then cost cause I didn’t want to end up “house poor”. Part of the real estate crisis is that too many borrowed and spent beyond their means. Poor financial management on their part and those of us who were responsible have to bail them out. Without a question that was the biggest problem with the bubble bursting. Even since the bubble has burst I see families every day that live well beyond their means. Good thoughts on buying a house. A few thoughts I disagreed with though. Your idea of buying a newer house because it will have contemporary upgrades is a good one, but I’ve found that many of the houses that were built since 1990 actually weather more poorly than those built in the 50’s and 60’s. I get what you’re trying to do by going newer, but the quality standards I feel were higher on most “builder” grade houses earlier than there were now. What I really liked was actually the very next paragraph, keep your house upgraded. I’m a bit guilty here, but I think that you should enjoy those upgrades yourself, so don’t wait until you decide to sell before putting in a new kitchen. Upgrade those windows. Get some enjoyment out of the upgrades, because they’ll do almost the exact same for your value now as in 5 years. Hey Karl, yeah, I didn’t mean you HAVE to buy a new house but if you plan on buying an older one then keeping it updated is vitally important. We’ve looked at a lot of houses that were built in the 90’s and it’s AMAZING how quickly they get outdated. There is a night and day difference from 1995 houses and 2010 houses. Waiting to do the upgrades until you sell is definitely worth avoiding. The thought of throwing in $15-20k to fix up your house only to get rid of it is tough to swallow. I’d like to think I’d save money along the way and upgrade one thing at a time as the years went buy. Maybe tackle small $1-5k projects and that way you don’t have the huge burden/bill at the end. As of now – none! But we just moved in 1 month ago! We ll see what we did wrong in 3-6 years I’m sure. LOL. Was it your first house? If it wasn’t then it’s likely you didn’t make any mistakes (or just a few small ones). Congrats on the purchase by the way! Many people don’t keep the resale value in mind. It looks like you learned the hardway, but sometimes it’s the only to learn. You will never forget it. Our home-buying story broke all of the rules. We put 3% down, bought more house than is recommended and now don’t have any equity. The upside is no HOA dues and it’s a nicer house than many in the price range. We’re here for another 7+ years, so I’m not too worried, but it has put us in a position where I need to get my income up STAT! But these are great considerations. Our house is in a great location and is “up to date”, so resale isn’t a HUGE concern, but as it ages, we’ll definitely need to keep it up and update as necessary. In your case it sounds like it is working out, probably mostly because you were able to increase your income. For some people that is easier said than done. When most people are buying a home they need to be considering their current income and not just assuming their income can be improve a lot. These are great tips! It’s so tempting in our area to buy something in a city neighborhood….sometimes you can get the houses super cheap! But the city schools aren’t the most desirable ones in the area, so we’ll just have to keep saving. Number 1, top of the list, I believe, has to be WHEN you buy. Most people who got caught when the bubble burst got caught because they didn’t understand that house prices are cyclical, meaning they go up and down. Buying at the top of the market is a recipe for disaster. Buying in a recession is much, much safer. I don’t think you can just wait until a recession to buy. There are no guarantees as to when that might happen. Here in Vancouver the housing prices stayed pretty consistent despite the recession. And if you feel you’re ready to buy, do you really just keep throwing money away on rent in hopes the housing prices will dip again? That doesn’t sound very practical to me. This post couldn’t be more timely for. As I write this our realtor is writing up our first offer on our first home. I think you give some really good advice, and it generally is what we followed. We picked a central location (We live in the Minneapolis-St. Paul metro area) because it will have great resale value and will be flexible for whatever life throws at us the next few years. We are making an offer on a home with great “bones” i.e. new Furnace, AC, etc. One thing I do disagree with is this “In our scenario we only put 3% down on our home; yes, a no-no in the PF community.” I won’t get into it too much, but essentially we will be paying only a couple hundred dollars more a month; in fact, with a rental setup we would be paying potentially $300 cheaper than we were renting. Yes there are other expenses (and I am factoring in everything you listed above besides repairs) but overall it makes financial sense for us to make the switch to homeowners. DC, buying is definitely cheaper than renting in some areas across the country. I don’t think it’s the end of the world if you can’t put down a large down payment, but the point I was trying to get at is that it WILL effect your ability to resell it here in the next few years if housing prices don’t climb. From the sounds it though, you may live in it long enough to build up some equity and having a small down payment might not hurt you. I wish I had read this post before I purchased my first home when I was 23. I made all the mistakes you mention except I got lucky with the location – which is probably why I was able to sell it so quickly after only living there 3 years. Next time when I purchase a home, I’ll definitely keep the resale value in mind and be sure to save up a good down payment. I only put 3% down and got slapped with PMI. Just another one of those hidden expenses most people don’t think (or know) about. Carrie, we were fortunate with the PMI. I guess it came with a tradeoff though…since we live on the outskirts of the city we were able to get a USDA Rural Development loan and were able to avoid PMI. Looking back, I’d probably take a better location and pay the PMI instead of facing what we do now: targeting a miniscule resale market and trying to find people to live out in the boonies. I don’t currently own a home but I watch ridiculous amounts of HGTV and it regularly shocks me how often people will set a budget and then proceed to go way over it to get the house with the size and upgrades they really want. While I can understand that a well-done home is a good investment, it’s also quite risky if payments are so high that no money can be saved to put towards debt payoff or savings for the future. I couldn’t agree more, Shannon. Those people drive me bananas. It’s like money doesn’t even matter to them and their budgets really aren’t that tight. My guess is that they’ll face the repercussions down the road. ” Who doesn’t want to look at a 3,000 square foot house with 4 bedrooms, 3.5 baths, and all the new amenities that come with the higher-end homes?” ooh-ooh! Me! Me! I really have no clue why somebody would want that large of a house. This place is 40% of that size. With regards to the first to items on your list, we didn’t really consider them at all. We liked the place, it was in our price range. That was enough for us. I wouldn’t really consider such a huge house either. Then again, you have to spend $1M+ to get something like that where I live. So I’ve been trained to think that is an impossible goal. If I ever want something like that I’d have to settle in a small town far away from where I am now. Great post, Jason! Avoiding becoming house poor? I think we missed that memo! Our house isn’t too big for us or anything, but we probably should have bought a less expensive house and saved up for a few years before trying to tackle this much of a payment. Live and learn! Jeremy, I’m going to have lots more time in a short while here when 2/3 of my kids go back to school and I’d love to write a post for you some time! Michelle you are definitely welcome to submit a guest post anytime. I’m sure we’ll be in touch before then. Your house purchase does seem like it limited your finances. At least you are working hard to overcome your situation by finding lots of ways to save money while also building up side income. With the rate that your blog is growing, I’m sure you’ll have no problem with that mortgage. That sounds like a good plan to use your first home as your future retirement home. The rent in the meantime would add some nice side income. In your case it sounds like you actually wouldn’t want the home to go up in value or you’d be paying higher property taxes. Being that close to a beach would likely keep the value going up though. I’ve lived in a small 1200 sq. ft home as well as almost 9800 sq. ft. home, and I can tell you that your happiness dwindles as you start living in much larger home. You lose family bond as every family member wants privacy. I’ve learned one big lesson to share with everyone — never buy a home a square inch more than your actual need. Wow that sounds like a massive home. There is so much more to happiness than the size of your home and amount of possessions. Taking on such a big home would also put extra pressures on you with a more expensive mortgage, higher taxes and even the need to buy more stuff to fill it up. People know that they can get by with a smaller house, but they just assume any extra space would be a huge benefit worth paying more for. We had a terrible realtor AND loan office for our first home purchase. We didn’t know you can shop around for those. It took so long with mistakes each made and tying up loose ends that we had to live in a motel for two weeks because we had to start our jobs and had no place to live. I’ve learned that if someone isn’t working, there are plenty of others our there who are happy to have your business. It ended up being a good house though, just frustrating in the beginning. Sounds like a bad experience. A good realtor can make a huge difference. Some people just assume that having a realtor is just a formality and is only there for the technicalities. Really though, they can find out so much more about a house and recognize any potential problems ahead of time. A good realtor would also have strong mortgage broker connections to keep the process running smoothly. We were smart about not being house poor. What we were not smart about was location. We were on a corner in a high traffic area. A lot of noise! I guess that was part of why the house wasn’t too expensive. There really are so many things to consider when buying a home. For some people all that noise would be unbearable. Great posts Jason. To many times people only think about the present when buying a home and not the aspects of selling it down the road. If you’re looking to buy a short term property you have to really consider what other people want to see. I had that kind of thinking with my car purchase. I bought what I wanted today rather than what I would also be able to sell for a decent price down the road. Hopefully that lesson will help me when buying a home. If you’re thinking long term it’s not just about what you personally want. It’s also about what potential buyers will want later. I think location is definately important, I’m going to be buying a house next year so I’ll be careful to watch out some of these things and keep an open mind. The thing about location is that you have to consider long term location potential. Some areas are in the midst of revitalization or cleanup efforts. So while the location might not be ideal today, it might be substantially better down the road. For sure. You don’t want to limit your future reselling market by settling for things that would scare a lot of people away. I would think most buyers do not think that far down the road though. They are instead just focused on what they personally want. Another mistake is to avoid getting carried away with upgrades when buying a new home. The upgrades can amount to a lot if you are not careful. Very good point Kanwal. Once someone decides they are going to buy a home that needs some upgrades, they get caught up trying to turn it into their dream home. They probably wouldn’t be considering which renovations would add sufficient extra resale value later. Thanks for these great tips! I think no. 3 is very important. We should be financially prepared to buy that dream house. When finances are well planned, owning comes in smooth and stress free. Great tips. Sometimes, we are overly excited about owning our first home and forget about the financial aspect of buying one. Thanks for the heads up. Conveyancers can save the seller/buyer time and money. What’s more, you are assured that the entire process is done right. Mistakes are costly. This is a good heads up for those who are on the hunt for their first home. Also, they should not forget about the legal process of buying a home. A conveyancer will be a great help.